Not a lot of people thought an Italian restaurant on the top floors of a commercial building in Wan Chai would work, but Pirata proved them wrong. 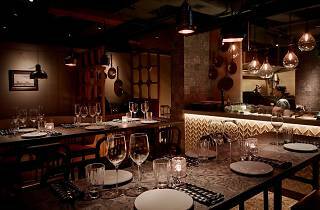 Using quality ingredients to make rustic Italian fare combined with an unpretentious vibe, on top of budget-friendly pricing, this eatery is becoming the go-to place in Hong Kong for solid offerings and just a generally enjoyable night out. Hot on the heels of Pirata’s success, founders Christian Talpo and Manuel Palacio have embarked on a more ambitious undertaking. 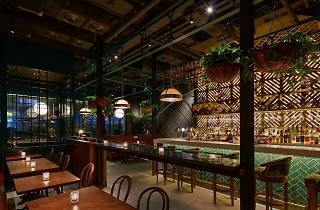 Staying within the confines of their current building, the pair have reshaped the first three floors of 239 Hennessy Road into a bar area and restaurant that serves barbecue ‘asador’ items and other dishes from northern Spain. For a couple of restauranteurs who opened their first endeavour less than a year ago, this new venture certainly seems bold and optimistic – hence the name. Bedecked with lush greenery and teal-coloured walls lined with botanical illustrations, the decor at The Optimist seeks to deviate from the stereotypical wrought iron and terracotta tones usually associated with Spanish restaurant design. But instead of the surroundings stimulating a craving for salad, the smell of charcoal prevails and we can’t wait to tuck into some meat. Appetisers come in half and full portions. Accustomed to tapas plates when it comes to Spanish fare, we pick the larger option. First to arrive is the huevos rotos ($130), the broken egg, a medley of potato, minced chorizo, fried egg and cured ham. The salty, spicy flavours of the sausage add an extra layer of flavour to this comforting food. Next to arrive is the octopus ($220). 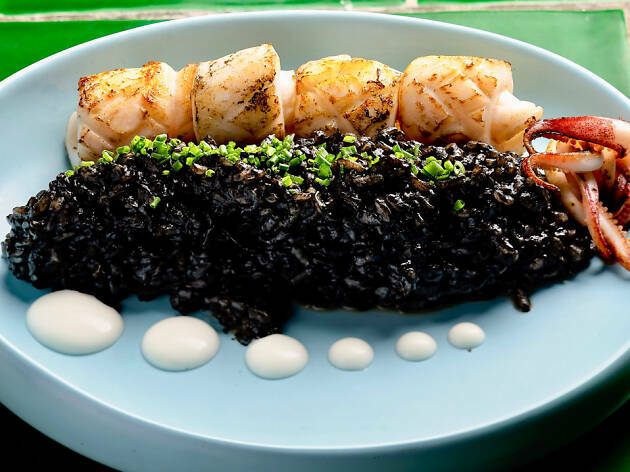 Heavily charred, the texture is extremely tender and the paprika and garlic aromas of the ajeda sauce enhance the taste of the mollusc – and already we’re regretting ordering the full portions as the plates are sizable and satisfying. First of our mains to arrive is the royal sea bream ($360). Arriving in a luxuriously rich seafood sauce, two pieces of fish sit on top of a bed of clam and shrimp. There’s a very distinct flavour and texture to fresh fish and unfortunately the sea bream does not have it. There’s just a certain sweet and suppleness that wasn’t present in the dish, although luckily the sauce is strong enough to cover the less-than-optimal quality of the main ingredient. It’s not bad, just not as stellar as the rest of the meal. Fortunately the grilled meat is such a winner that the disappointment of the previous course instantly fades into the background. Even though it’s listed under the menu’s ‘not too big’ category, the entrecot ($420) turns out to be 400g of tender 21-day aged steak that could easily feed two hungry adults. The quality of the beef is exceptional, and combined with the melt-in-your-mouth consistency, it’s easily one of the best steaks in town. We’re almost too stuffed for afters, but we power through and order Alfredo’s warm apple pie ($95). It’s a simple dish with, true to European style, thinly sliced apples concentrically layered on top of flaky pastry. Drizzled in custard sauce, the dessert is a light and refreshing way to end the meal. The Optimist offers simple, hearty dishes designed to satisfy customer expectations and stomachs. 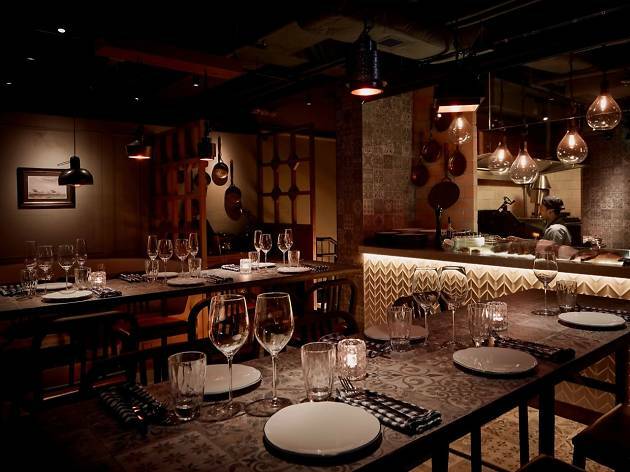 Happily, it also smashes the misconception that Spanish food is all small plates – and does an outstanding job, too. 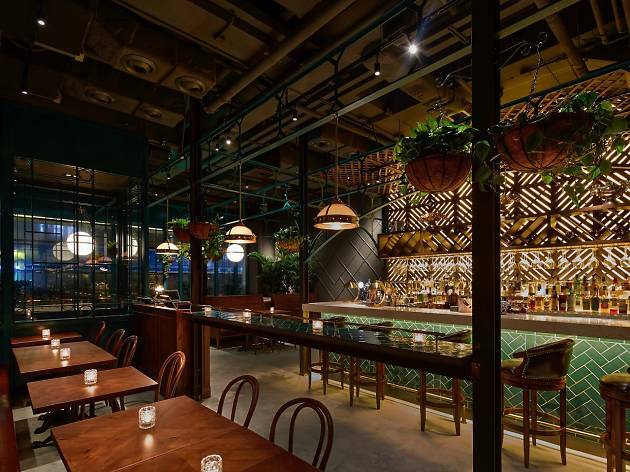 Three storeys is quite an ambitious undertaking, but the decor, vibe and good food is just what the commercial part of Hennessy Road needs to draw in the merry-making crowd. In combination with wallet-friendly prices, we anticipate the dining room will be as popular as its older sibling in no time.